Does the iHeater Really Work? The iHeater claims to be able to heat a room for a cost of about a dollar a day. For many people this is a sharp reduction in the amount of money they spend on heating costs through the winter. You might think that this is made by the Apple Corporation but it’s nothing like an iPod or an iPad. However, the amount of technology used in this portable heater is pretty impressive. Up until now there hasn’t been a really great way to heat a small room in your house. Heating systems that heat the entire house are overkill when it comes to just one room. Conventional space heaters leave much to be desired in the amount of heat that they produce for the energy that they consume, not to mention how loud they are. The iHeater promises to fix all of that with just one unit. The iHeater claims that it uses infrared technology in order to heat the room which uses less energy, and creates more heat using less resources. This makes it seem like the best of both worlds by providing more heat for less cost, and doing it all more safely and quietly. They also say that no matter how much heat your iHeater generates you’ll be able to touch it without burning your finger due to its infrared technology. They also claim that it’s whisper quiet, which would be a major improvement over the other types of heaters, which can make a racket. In fact, some heaters are so loud that you can’t even watch TV without turning it up, or have a conversation without talking over them. Plus, the more you use a space heater the louder it becomes as it wears out. They say that it heats a room evenly, which if you have any experience with a conventional space heater you know that it heats the area immediately in front of it first, and then the rest of the room receives any residual heat. Traditional space heaters can leave large parts of a room cold and drafty, and just a small area heated properly. There isn’t much in the way of hype when it comes to the iHeater. Heating your house in the winter can be expensive, and the normal ways that people have of heating their home are outdated and laden with problems. The promotions that they run for the unit are mostly hype-free, basically stating what it can do for you, but not going overboard exaggerating the claims and making the problem seem worse than it is. 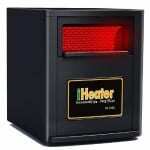 The iHeater isn’t cheap, and you can get conventional space heaters for far less money. It makes its sale by how much it will save you and your monthly heating bill compared to other models. When you factor in multiple years of use, the cost savings really add up. That being said, you can get the iHeater for $250 delivered right to your door from Amazon.com. You may also order direct from the manufacturer for some added bonuses, and also as a guarantee that you’re receiving the most recent model. Committing to using the iHeater is a breeze. All you have to do is turn it on to your desired setting, either small, medium, or large-sized room, and let it go to work. You can use it as a replacement for your current ineffective space heater, or cut back on using your central heating system when you only need one room heated. There are some pretty bold claims to live up to, so we had to put the iHeater to the test in real world situations. Users have reported that the iHeater does provide comfortable warmth throughout the room, and that you can stand right next to it without burning yourself, it won’t start a fire if it gets tipped over, and that it’s safe to have around kids and pets. When comparing the cost of running the iHeater with conventional heaters, and whole house heating systems the cost savings are obvious. Most people report a 50% reduction in their heating bill, while others who use it more extensively reported a savings of 75%. These are numbers that you can’t argue with as far as savings go. The savings can be used for more important things in your life instead of going down the drain in your heating bill. This can also be considered a green product because it reduces the total amount of electricity that is used to heat a room, it’s better for the environment overall. No matter what your reason for getting an iHeater it’s nice to have a product that not only saves money, but is better for the Earth. The reviews are in an the iHeater clocks in as a winner. It’s major features are that it can heat a room much more cost effectively than using your old space heater or your central heat and air system. Also, buyers said that they liked that the air was cleaned as well, and not just re-circulated. If you’ve got a small to medium-sized room that needs heating, you can’t go wrong with an iHeater. Our favorite feature is that it’s safe for your home and you don’t have to worry about your kids or your pet bumping into it, knocking it over, or touching it. You can’t say that for other space heaters, not to mention the fact that it’s super quiet. What do you think? Does the iHeater work or not? Does Flip Fold Really Work? Does the Panasonic Countertop Induction Oven Really Work? I have an iHeater that i use in my garage througout the winter. It’s a great heater most of the time, but sometimes can struggle to provide enough warmth if it’s really cold outside. I was looking for something that was efficient and good at heating the room evenly, and iHeater certainly comes in on point for those. More expensive than most other heaters, but if you take in to consideration the reduced cost of running then it all balances out. I have a space heater, although not this one. It’s true that they heat without getting very hot to the touch themselves. In winter, we have it running in the living room and close off all the other rooms to save energy. My space heater (which looks very, very similar to the iHeater…I wonder if it’s a knockoff of the iHeater?) has the whole room warm within about 30 minutes or less. In the meantime, though, we do have the central heating on low, to keep the other rooms warm. I purchase the iHeater and was I glad I did. I have an older home and it was costing a fortune trying to keep my home warm in the winter months. Not only did it warm the area where I put it, but when it reaches the warmth it will turn off. I tried it for two weeks and the area was warm, so I purchased a second one. My heating bill went from three hundred dollars a month to two hundred dollars a month. It doesn’t seem like a big savings, but when you save that for five months each year, then the heater pays for itself and my house was toasty and warm. I grew up with parents who swore by space heaters. They would keep one in the bathroom so that we could put our towels over them to let them warm up so that they would be toasty right after a shower or bath. I loved it! They also had a second one in the bedroom to provide some extra warmth. Using the units allowed them to keep the thermostat lower, which saved them a lot of money on energy costs. Now that I am on my own, I have a space heater that I swear by every winter. This is definitely a worthwhile investment. Had my first one 6 years got a second one two years ago.. I have a 1500 sq feet home and they both keep it warm.cost around $60 a month on average when used.. glad I bought them..
We have 2 IHeaters and 2 Eden Pure’s. Our house is 2400 sq ft, 2 levels.. We have a oil furnace that we haven’t used in 9 years due to these heaters. We use one in the basement all winter. And one upstairs in the living room all winter. The other 2 are back up when it gets really cold. We live in Montana. I swear by them both. Diesel was getting to expensive to heat with. Our bill gets up to $200.00 in Jan and Feb. That is running the whole house on electric. But we would be spending 3 times that on diesel fuel to heat with per month. because of the presewnce of several scams. In addition, you will get different compartments within the shed or garage. or perhaps as your Home Office.